San Antonio and Austin have always had a bit of a rivalry. They have the Alamo. We have the Capitol. They have the Riverwalk. We have Sixth Street. They have the Spurs. 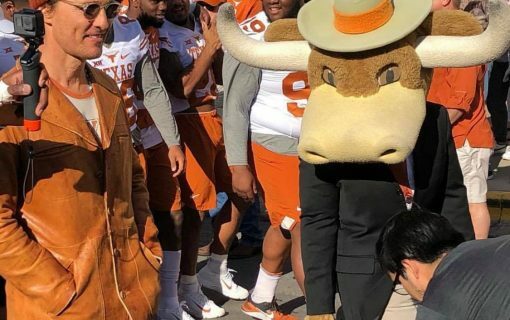 We have the Longhorns. And we both have breakfast tacos. Who can forget the great taco truce of 2016? The mayors of both cities came together to celebrate all breakfast tacos and to declare March 10 as Breakfast Taco Day. In the spirit of that cooperation and camaraderie, why not encourage your San Antonio friends to come to Austin for a road trip? Not only will they experience our great city once they get here, but they’ll also have some stops along the way to help enjoy the trip. After all, I-35 needs all the help it can get to make for an enjoyable traveling experience. 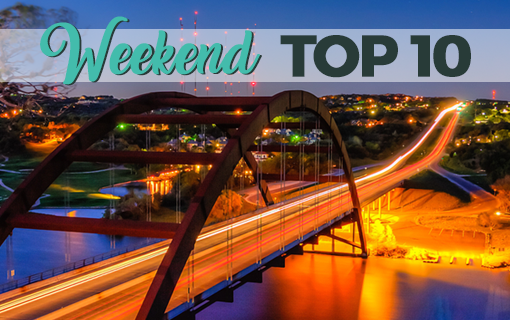 Once the northern outskirts of San Antonio are in the rearview mirror, the first place to stop is New Braunfels. 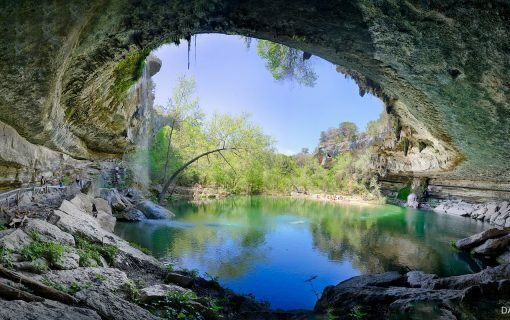 With the original Schlitterbahn Waterpark & Resort and the Gruene Historic District both located within the city limits, it is no wonder New Braunfels is one of the most famous and most visited small towns in Texas. On the way from San Antonio, the first New Braunfels attraction is the place Ray Wiley Hubbard immortalized in the song “Snake Farm.” Animal World and Snake Farm Zoo has more than snakes, of course. The place was bought by new owners in 2007, and they’ve been implementing big plans including the restoration of the original exhibits and expansion of their facilities. And while there may be a woman named Ramona there, she probably doesn’t have a tattoo of a python eating a mouse like Hubbard’s song lyrics say. On the north side of town, the Gruene Historic District has a ton of shops, restaurants and inns to keep you wandering for hours. The two most famous attractions are Gruene Hall where many Texas country artist put on shows and record live albums and the Gristmill River Restaurant & Bar. If you're not a #George fan (and who isn't a George fan) then please excuse the following overload of posts…. Next up the road is San Marcos. The hilly landscape of the town is dominated by Texas State University, particularly the Old Main building which resembles a gingerbread house. It's a great day to be a Bobcat at #txst! Part of the University, the Meadows Center for Water and the Environment offers glass-bottom boat tours of Spring Lake. The water bubbling up from the lake’s bottom feeds water into the San Marcos River. Boat passengers peer down through the glass to see the underwater springs and the fish and turtles that make the lake home. Above the surface, passengers view wetland waterfowl and plants. After your boat ride, you’ll probably want to fill up with some food. Gil’s Broiler is San Marcos’s oldest restaurant. While they’re famous for their Manske Rolls (their take on a cinnamon roll), their burgers are hot, flavorful and worthy of comparison to the best burger dives. And if you have money burning a hole in your pocket, San Marcos has two outlet malls right across the street from one another — Tanger Outlets and Premium Outlets. 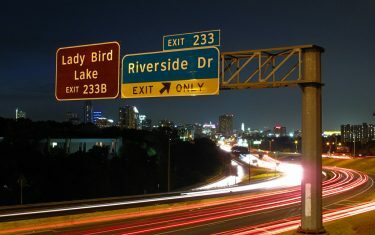 After San Marcos, I-35 consists mostly of urban sprawl until you get into Austin. However, the little towns of Kyle and Buda (that aren’t so little anymore) are bedroom communities that have charm and personality of their own. Many suburbanites commute into Austin but also take pride in their small towns. If you decide to pack your golf clubs for the road trip, Plum Creek Golf Course offers a much better experience than you’d expect from a suburban public course. The course winds through the large Plum Creek master planned community. Just before you cross into Austin, Buda offers a handful of local restaurants that’ll make you glad you stopped. If you’re in the mood for Mexican food, try Helen’s Casa Alde in downtown Buda. If you’re hankering for some barbecue, visit Sugabees food truck on FM 1626 just west of Buda . Once you roll into Austin, you’re already in one of the coolest parts of town — South Austin. And here at Austin.com, we’ve got your itinerary covered with South Austin happy hours, date spots, cheap meals and weird things to do. For more about road trips to Austin, check out our Dallas Edition and Houston Edition. Feature photo: Flickr user Matthew Rutledge, creative commons licensed.